Most of you know that we’ve been doing this for a few years now. Partly it’s because we’re cheap broke, and partly it’s because we send this link to nearly 200 people who we’d legitimately want to send a real card to. Also, I’m not big on the card produced by Shutterfly and never seen by the sender thing, and this method actually has a Snowflake’s chance in Cambridge of generating a conversation*. So we do it this way. Well, we were almost under the illusion that Spring was here, and then Winter decided to play a little prank on us. Not quite as spectacular as the big blizzard back in 1997, but still, very winter-like weather. Here in Winthrop the weather has switched back and forth quite a bit between rain, sleet and snow. Right now it is snowing, and has been since I got up this morning. I doubt much of it will stick, though, and that seems to be David Epstein’s assessment as well. Still, it is nice to see a beautiful winter landscape one last time before spring really arrives. Today is the day that we traditionally celebrate the men who have held the office of the President of the United States. Over the years that celebration has gone from actually thinking about the Founding Fathers to indulging in a long weekend, sales on automobiles, and deep discounts at your local mall or favorite online store. Over the last couple of days, we had our first nor’easter since we moved to Winthrop. The storm caused wind speeds here near the coast to pick up quite a bit, and as result there was a pretty heavy surf along the beaches here too. 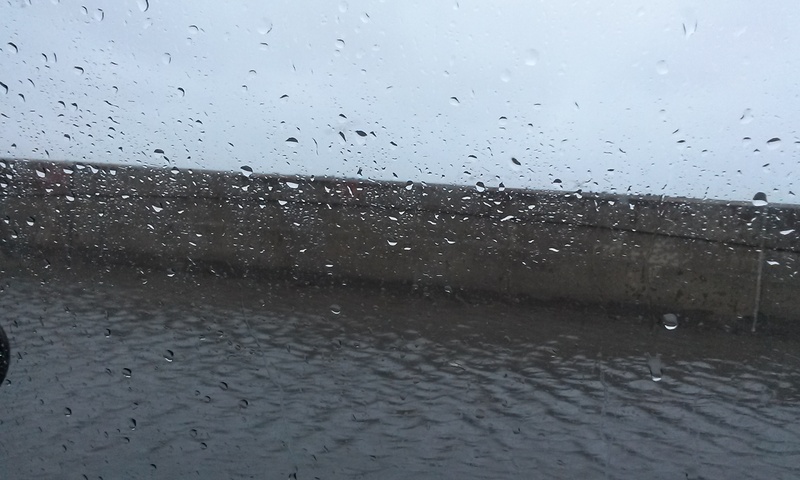 That is all seawater that came over the wall. Yes, historic. No, I am not being overly dramatic. I have plenty to say, but as an introduction I want all of you to hear what Samantha Bee has to say because she puts it in its proper perspective and frankly, it’s something I think we all need to hear. She’s right. As Kelly pointed out on our Twitter feed earlier today, a lot of people (particularly women) see this election in its proper context as (quite probably*) the first election of a woman to the office of President of the United States. And that is absolutely HUGE. More to follow soon, I promise. *Unless this turns into another too-close-to-call nail biter like 2000, we’ll probably know soon enough, won’t we? Anybody following this interminable election cycle has probably seen the mud slinging, the by turns insane, hilarious, and terrifying GOP debates, and the charges back and forth in the Democratic camp of “Feminists vote for Hillary” or “You’re not a feminist if you Feel the Bern” etc. As anyone who reads this blog regularly knows, neither of us is going to vote for anyone with an R after their name, especially in this current bunch of lunatics. There is no lesser of two evils here, there’s just psychopathy, sociopathy, delusions of grandeur, pathological lies, hate, and stupidity. And that’s just Trump. As most of you know, Geoff and I go out of our way to keep from swearing in this space. This is mostly because this blog is read by our parents and both our mothers have been known to need smelling salts if they encounter too many F-bombs. That being said, we both swear like sailors IRL and, as Geoff has said many times, he learned his particular talent for blue language in Cub Scouts and then basically got a graduate course in Foul Language in the Army. So this post, both as it pertains to swear words, social media, writing, and the evolution of language, is very interesting. I’m posting it here knowing that it will likely make our mothers reach for the smelling salts. Be that as it may, the social science behind it is really interesting. Also, the Strong Language blog is quite a read and worth checking out. More after the jump.